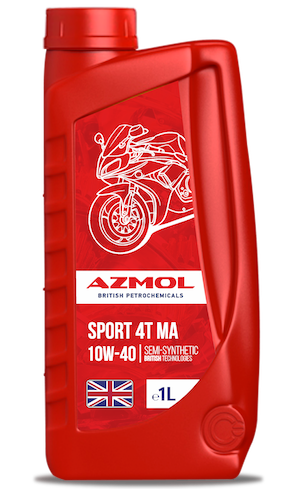 AZMOL Sport 4T МА SAE 10W-40 – semi-synthetic motor oil for road and off-road motorcycles, Enduro, trial, equipped with four-stroke engines with integrated and non-integrated speed box and" dry " clutch and with oil bath clutch. Designed for engines that meet the requirements OF Euro 2 or EURO 3, equipped with an exhaust gas treatment system: catalysts, exhaust gas recirculation. Other uses: motorbikes without catalytic converters, scooters, ATV, mopeds. Ideal for motorcycles with mileage, used in a sharply continental climate. excellent lubrication of various engine parts and reduced wear of its components.